We let our man-made pond out front go stagnant a few years ago when the fountain got knocked over. We soon learned that the local frogs liked it better that way. So now our monster, 4-year-old goldfish has a friend or two who come by every year. It's also worth noting that this pond does not sprout any mosquitoes. They are likely too tasty. The goldfish is the red blob at the top right. Can I offer a suggestion for the creaking/groaning treadles? My husband likes shooting black powder, and there's a all-in-one cleaner/lubricant called Ballistol that a lot of shooters like. I've been using it on my Kromski, and its amazing. I apply it to the metal-on-metal joints once a month or so, wipe down with a q-tip (black gunk will start to appear after a rotation or two) and its good to go. I used to get that squeaking and groaning frequently, in fact, Kromskis are known as oil hogs. The Ballistol lubes her up so well, I get NO resistance when treadling, so when she starts slowing down, a couple of drops and we're back to the races. If you'd like, the next time I'm in your neck of the woods I'll bring some for you. Thanks for the suggestion. Also, it was good seeing you at the festival. Does your goldfish overwinter outside? Yes. It hibernates under the ice in the muck at the bottom (I guess). That's a very handsome frog you have there. He (she?) is also quite smart. 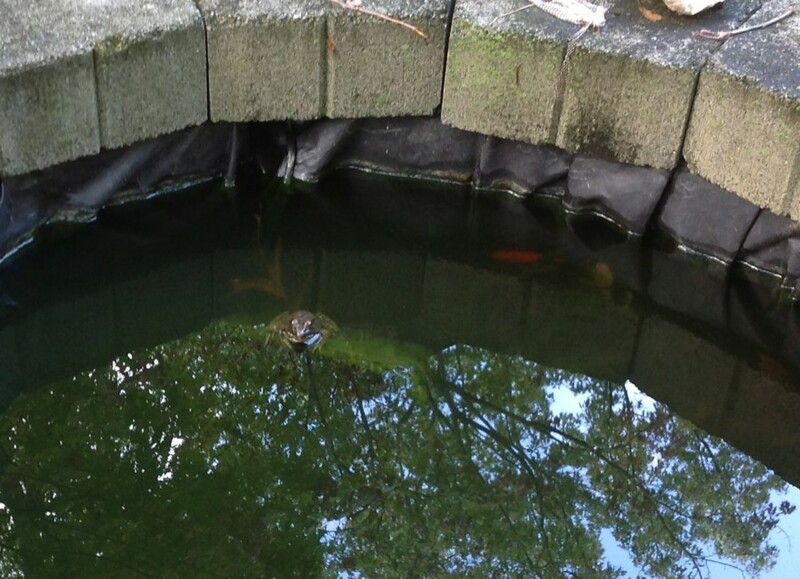 It knows how to get in and out of the pond through the drainage port directly behind it (where the cord goes through). I was considering it. Of course, he might try to run away, but then I get to chase him. Am I allowed to chase the chickens though? I've got a long list at this point: Goats: yes; Llamas: No; Frogs: Yes; Alpacas: No; Puppies: Yes; Chickens: ??? I'm picturing you floundering around in that little pond trying to chase the frog. Mucky stuff! Blech! Chicken chasing? Um... yes? Probably not until they know where home is, though. I understand that they are kind of random about things like that. Poor chickens. I almost feel sorry for them. This page was loaded Apr 23rd 2019, 6:50 pm GMT.